When Marc Robinson traveled from Spokane, Washington to Berkeley, California in August 2017, it was in the name of narrative history. He came to the Advanced Oral History Summer Institute to work on his project about black student activism in the late 1960s, which was somewhere between dissertation and manuscript. He had done some interviews while earning a PhD in American Studies from Washington State University, but felt like he was just scratching the surface. Like many who understand the value of oral history in doing contemporary history, he wanted to talk to more people, get a broader range of narratives, and explore the way that some of the stories he was recording contradicted archival documents. Robinson’s doctoral research was about student activism on campuses in the Northwest, particularly around those who were in the Black Student Union during a time of social and political unrest in the 1960s. He focused on two campuses, one urban — the University of Washington — and one rural — Washington State University. After doing several interviews with students who were active there, Robinson wanted to broaden his cohort of narrators to include not only black students, but their allies and the larger community of people connected to the Black Student Union, but were not students themselves. He came to the Summer Institute looking for more training in longform life history interviews and left the program thinking deeply about what this type of interview can really provide to a researcher. “Narratives aren’t really telling the Truth, but their recollection of what happened as it pertains to them,” he says. He found that some of the narratives that he had collected challenged the materials he had found in the archives, which made him see interviewing as an opportunity to understand the complexity of memories. The program taught him to expect this complexity and see oral history as having transformative power. Another takeaway? The importance of the tech side of interviewing. “It made me think more about headphones, mics, the quality of sound, and knowing your equipment,” he says. 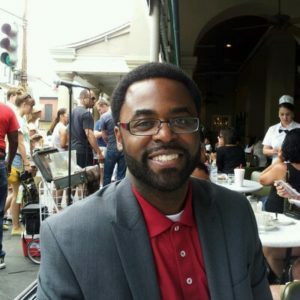 Since his time in Berkeley, Robinson was hired for a tenure track faculty job in the History Department at Cal State University San Bernardino (congratulations, Marc! ), where he’ll start in the fall of 2018. He plans to continue working on his project and is interested in getting his students involved in the interviewing process. “It can be a really valuable teaching tool,” he says. He hopes to get his students involved in projects that illuminate local history, current events, and the community, something that Cal State San Bernardino has a track record of. Please join us in congratulating Robinson on his new job! Look out for his book, which is on track to be out by 2020. We’re excited to see what he learns from his next round of interviews and what they can teach us about the times we are living in now. Interested in learning more about Robinson? About the SI or joining us in 2018? Follow him on Twitter @MarcARobinson1, and apply for the SI here.